by 2018, regulatory agencies have begun to place more scrutiny on the adherence of temperature requirements during transportation (1). 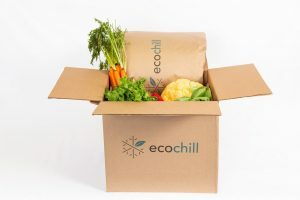 The sector is racing to catch up to meet the needs of proper temperature management for a wider range of products, including refrigerated, frozen and control room temperatures that are being delivered through evolving methods such as mail orders. As new technologies and practices evolve to provide for the growing demand, it is important to understand their fundamentals in order to avoid misconceptions and be able to detect false claims. With the availability of smaller, cheaper and less sophisticated temperature monitoring devices, it can be tempting to use them on a regular basis to determine conditions during transportation. However, with the wide variety for sale and the numerous variables that can impact the quality of their readings, these can be misleading. Most only measure the air temperature, which can vary by several degrees from the pharmaceutical or biologic’s actual temperature – especially if the product is liquid. Some low cost indicators utilize chemical conversions to give a general idea if the desired conditions have been maintained. These devices have a broad accuracy relative to a tight range, typically of 2-8°C. Another downfall is that most require a set storage time within a specific temperature range before they can be used. Once they are ready, they must be maintained within the temperature range otherwise, false readings can occur. This is possible during packing or when the containers are opened at their destination, which could trigger an excursion reading when the drug is not even in contact with the indicator. More expensive and specialized equipment can track data and provide a visual output of excursions on the device itself, or the information can be downloaded to a computer to generate a graph – these are beneficial due to the added time and temperature data that are available. A trained user could properly interpret and make decisions based on the information. However, they could lead to significant confusion and false interpretations to any untrained personnel, such as a home delivery patient. There is currently no industry standard for the proper placement, usage, quality or quantity of temperature loggers used during transportation – even though these factors are critical in providing accurate results that reflect the genuine temperature of the pharmaceutical or biologic. False excursion readings that are not representative of the product can result in unnecessary destruction and reshipping. Conversely, if a device was shown to be correct but the drug was not actually maintained at the correct temperature, it may be consumed with a lower or ineffective potency. The discrepancies between the monitoring device and product temperature are even more likely and extreme when cold sources like gel packs are used in the shipping container. If the use of a tracking device is desired, the quantity and optimal location inside each container should be studied and determined. The proper handling procedure would need to be developed for all packaging types, as well as minimum and maximum payload sizes. Using this method can alleviate the need for temperature monitoring in every shipment. Monitoring the temperature inside every container is not feasible for most users and can easily provide false readings. The utilization of qualified packaging systems is an industry standard for safely transporting temperature-sensitive pharmaceuticals. They are developed and tested in laboratory settings using variables that are consistent with actual shipping environments and conditions. Payload temperatures are measured at multiple locations to ensure that products are always kept within the required conditions. Once a packaging system is designed that meets the required time and temperature criteria, the users can implement the handling processes in their shipping programme to keep the products at the proper temperature during transportation. Qualified packaging systems are available in two forms: a pre-qualified or a custom designed solution. ‘Off the shelf’ pre-qualified solutions are developed to maintain a specific temperature during shipping and are tested using specific criteria, which allow them to be validated for those specific conditions. However, if the user’s variables are not equivalent to the qualification criteria, then this approach is at risk of not maintaining the appropriate temperature range and may not be cost-effective. The shipping temperature profile is the most important parameter when evaluating pre-qualified or customized packaging solutions. If a pre-qualified container was tested and validated for a profile that differs from the actual one seen during transportation and handling, the package may not maintain the pharmaceutical or biologic within the required temperature range. Due to the high amount of variables that must be analogous between the pre-qualified packages’ design criteria and the actual usage, many companies have been shifting towards a customized qualified package. Taking the time to properly modify the development of a permanent shipping solution will result in an optimal design that has the most effective temperature performance and provides significant cost savings, which cannot be achieved with pre-qualified packages. 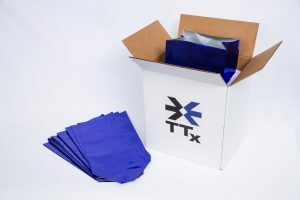 A tailored package will also result in better performance as it utilizes a temperature shipping profile unique to the user’s transportation and handling systems. The custom package is typically lower in cost because only the components necessary to maintain the temperature profile are needed. The majority of these savings are the result of a reduced number of cold sources, such as frozen gel packs. This reduction creates more payload space for the drug products, allowing smaller packages to be shipped and thereby simplifying the pack out. Besides the ability to reduce component cost, smaller and lighter shipments create significant transportation expense savings. Awareness is increasing for the importance of proper temperature maintenance. 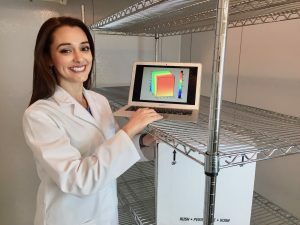 As a result, there has been a rise in the use of handheld infrared (IR) thermometers by end users with the goal of verifying the conditions at the end of the supply chain. IR technology has been successfully utilized in trial and research settings for decades, but new innovations have reduced cost and ease of use. The emissivity pattern of some materials known as non-grey bodies – such as glass, metals, paper and plastic films – can affect the accuracy of the temperature reading. Matte or low reflective surfaces have high emissivities, between 0.8 and 0.95. By contrast, polished or shiny surfaces have emissivities around 0.1. Most IR thermometers are using a fixed emissivity value of 0.95, which decreases the accuracy of the readings for reflective surfaces. Typically, the greater the temperature difference, the more accurate the IR thermometer. The difference between the surrounding environment and the shipment’s temperature is usually not large enough to provide suitable accuracy. It is important to note that IR thermometers only measure the surface temperature of a drug’s packaging. This is known to change rapidly and is not representative of the actual product temperature. For example, a vial of insulin kept at 2°C in a refrigerator was brought into a room at 24°C. A probe measured the liquid while the surface temperature of the vial was read using an IR thermometer with the standard set emissivity of 0.95. The temperatures were recorded every 30 seconds for 6 minutes. 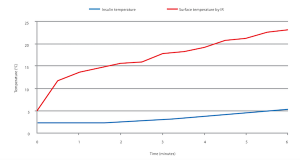 The actual liquid temperature of the insulin increased slowly from 2 to 5°C, while the surface temperature measured by the IR thermometer had an initial reading of 5°C and reached the room temperature of 24°C within 6 minutes (see Figure 1). Due to the rapid surface temperature changes, simple handling of a package can result in false readings. For example, touching it before measuring the temperature with the IR thermometer can significantly affect the result. 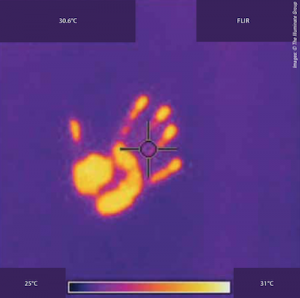 By simply picking up the package before measuring, the thermometer could read the heat generated by the hand (see Figure 2). Using IR thermometers to measure the temperature of drugs is not recommended since many parameters specific to each product as well as the IR device must be known and adjusted beforehand and they do not provide an adequate method for determining the actual temperature of a pharmaceutical. Used as packaging components for transporting temperature-sensitive products in both parcel and pallet systems, radiant barriers typically come with a small layer of protection, such as metalized bubble wrap bags or pallet covers. This metalized aspect works to reflect heat from radiation that is generated from the sun or a hot surface. They do not have significant insulation properties and so provide little thermal protection, especially when it is not exposed to the sun. Heat transfer by conduction is the quickest method to change temperatures and requires two objects to touch. A radiant barrier will provide minimal thermal and no radiation safeguard if used inside a shipping container and if it has contact with the walls. Typical products used in the temperature-sensitive transportation industry include metalized bubble wrap bags, similar to the kind found in mail order shipments and in supermarket freezers. Testing has shown that these products offer a similar thermal protection to a regular plastic bag. Unless these bags are exposed to the sun, their benefits are negligible and they add significant expenditure. The input from solar radiation is noteworthy, however, and can drastically increase the overall temperature of shipment during exposure, such as on the tarmac at an airport. 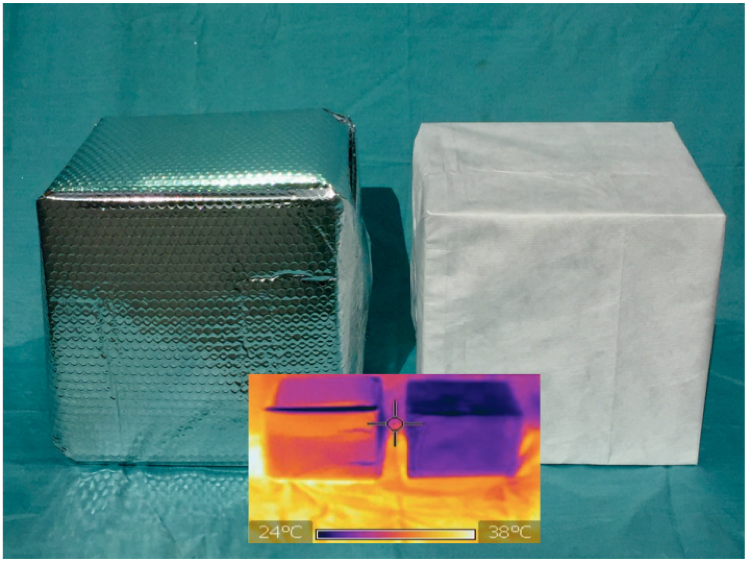 Many thermal protection systems utilize metalized foil with a small insulator such as bubble wrap to cover an entire pallet; metalized foil is perceived as a reflective material with the ability to reduce the incoming heat caused by radiation. Importantly, the texture and surface finish of a radiant barrier is critical when choosing one that will be beneficial. For example, an embossed foil cover absorbs more radiant energy from the sun and causes heat power to quickly conduct to the payload. In contrast, a radiant barrier made of nonwoven material with a white, glossy surface will reflect electromagnetic waves from the sun. Metalized bubble foil pallet covers have a textured surface with fewer reflective properties, whereas those that are nonwoven have more reflective characteristics, such as smoothness and a white color (see Figure 3). With an ever-expanding temperature- sensitive industry, a deeper understanding of the processes and principles related to new technologies and standards is necessary to provide thermal protection. By understanding the basis of the new systems, many misconceptions can be debunked, resulting in suitable practices that are working for your specific needs. Even with these innovations, developing a permanent qualified shipping solution that is unique to your requirements will culminate in an optimal design that has the most effective climate performance and provides significant cost savings.